I've recently taken up 'couponing.' 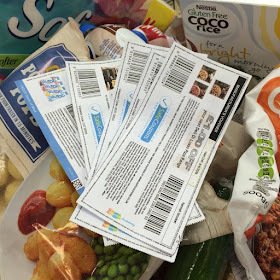 Over here, we call these little pieces of bar coded paper 'vouchers' but nothing sounds as good as couponing so from now on, I'll be running with that! I mostly print my coupons online which is time consuming and if I'm honest, slightly disappointing in the UK, we just don't do it that big over here (although if you shop at Asda you're in for a treat, there's often plenty about!) I google a lot, check out freebies sites like Magic Freebies and FreeStuffUK or Extreme Couponers UK. You can get coupons in store magazines and newspapers too. One other way of enjoying the brands I love is by the written word. I don't mention that I blog or mention my social media so there's no PR going into these letters, it's just me, my pen and some serious praising. Here are 8 tips for writing to companies and hopefully getting a little something for your efforts. 1) Be genuine. Don't just write to every company you can think of, this may get you a few more coupons but it also may not, and you'll be broke from the cost of stamps! If you're a genuine costumer who loves their product the company can tell, it'll be evident in your writing and you'll be more likely to receive a reply with, you never know, a coupon or 2. 2) Ditch templates! Get your pads and pens out and draft up letters if you're not a confident writer or sure what to say. I know several people who used templates from the Internet and of course it's obvious these are not genuine letters. It's even more obvious when you use these templates and so does someone else and then both send them to THE SAME company! So, give yourself some quiet time, pick a company you like and write a rough draft if you don't feel confident enough to dive straight in! 3) Write your address clearly! I write a return address at the top of my letters or on the left hand side if writing in a card. I also have address stickers or write a return address on the back of the envelope. Anything to make life easier. 5) Include the little ones. My most positive mail so far was the result of including one of the children in my coupon writing. Include a signature or a piece of lovely artwork, I'm sure it makes a letter of praise hard to resist when it has a sweet squiggle or a fab drawing included! 6) Don't ask for the free stuff. This is a personal one but for me? It's a no no. I write to my favourite and most used brands with words of praise and I've never included anything about myself (or my blog) and I've never asked for free stuff. I'd find it rude to ask and uncomfortable to read, I much prefer to compliment and see what happens! 7) Be different. So many people go for the plain A4 paper route or a quick email but I like to dig out my nice stationery or a card and as above, a little drawing from one of the children doesn't hurt either. You stand out and if nothing else, your card or sweet picture is bound to make someone smile. 8) Praise is good but genuine complaints should be considered too. Companies need to know when you've had a negative experience, maybe they can put it right? So instead of plastering your complaint all over Twitter or Facebook, write a letter! In my experience you often not only get a written response back but also coupons by way of apology. As I said though, it's always better to be positive but if you do have a complaint about a product, I'd always consider writing first. Do you coupon? Have you had any success with writing to companies? I'd love to know if you have or if you think you'll give it a go! Great tips, I've not done any couponing for ages must get back into it. I dip in and out, we don't see much of a saving because we get things cheap anyway but sometimes it's fun to see a good free voucher on something we don't normally buy! Love this! Great advice! I have to say, it really is disappointing in the UK. I do find I get a rush if I bag a bargain in the reduced aisle though!